Keiko (pronounced “Kay-koh”) is from Sydney, Australia – originally from Japan. She studied saxophone performance at Senzoku Gakuen College of Music located near Tokyo. Music and working with her hands have been always her passion. After working outside of the music industry for many years, she decided to dedicate her career to musical instrument repair. She extends her work in repair to her clients with education of instrument maintenance to help fellow musicians and students. Since the United States leads the band instrument industry, Keiko relocated here to study at Minnesota State College Southeast in Red Wing. It’s an internationally well-recognized band instrument repair program where she graduated with high honors. During her time in Minnesota, Keiko found one of the most respected and highly skilled technicians, known as a Master Technician in the industry, Scott Mandeville who she had hoped to work with at the time. After graduating the college, Keiko moved to Sacramento to work at Tim’s Music where she continues to advance her repair skills. Keiko enjoys working at Tim’s Music with highly skilled technicians and all of the crew who supports and encourages her every day to serve our mission together as a team: “Promote wellness in society through music performance and education.”  We truly aim to help people with their musical journey. Her mission at Tim’s is to provide the highest standards of instrument repair to support all students, their parents, as well as teachers and musicians with their technical needs. She feels it is her job to reconcile the relationships between the players and their instruments so that the players can have the freedom to express themselves through the instruments. 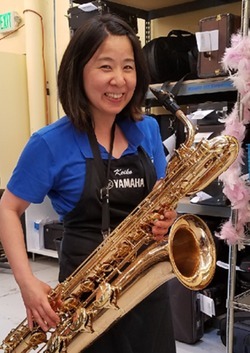 Keiko is member of NAPBIRT (National Association of Professional Band Instrument Repair Technicians) and continues to advance her craft of instrument repair through networking with technicians across the States and overseas. She also makes a habit of attending their repair conferences and other industry activities. Other than repairing instruments at her bench, Keiko visits local schools to talk about instrument maintenance and to check the condition of their instruments. Hearing about her clients’ stories of their music journey and behind their instruments motivates Keiko to keep learning alongside her clients. Just as Keiko strives to teach clients more about instrument maintenance, they teach her something about the meaningfulness of music, in their personal lives. When our clients come into the store for their kid’s instrument to have it serviced, parents have commented that they, too want to begin or get back to their own musical practice. Keiko is always happy when she motivates newcomers and people with some experience in music to continue playing their instruments. Lastly, as a professional technician, Keiko wants to emphasis the importance of the maintenance and repair of musical instruments, and she speaks from her own experience. It’s extremely important to have a well-maintained instrument to have a successful music journey. Keiko always sees instruments that are played by students for years that are far from a working condition. It is free to have us check your instruments and to receive an estimate on repairs. Please come by and show us your instrument to make sure your instrument is in great working condition. I’ll be here to educate and encourage you. I look forward to seeing you at Tim’s Music.